And now that I am back on these pages I am struggling with what to write. When I was writing daily it was easy to write about book I was reading at the moment, the TV show that caught my eye, or a movie that resonated with me. And my intention has always been to use this space as a way of keeping an illustrative diary of sorts of my daily life. Well, if anyone wanted to catch up on my life they would think I was dead, or just barely alive. That is not the case, yet. The pic of the bird above is pretty indicative of what life is right now.....brown and boring. We have no pretty snow, altho I am glad we didn't get the major dump that the east received from Storm Jacob. By the way, when did "they" start naming snowstorms? And it's a long, long time until Spring arrives in the midwest. 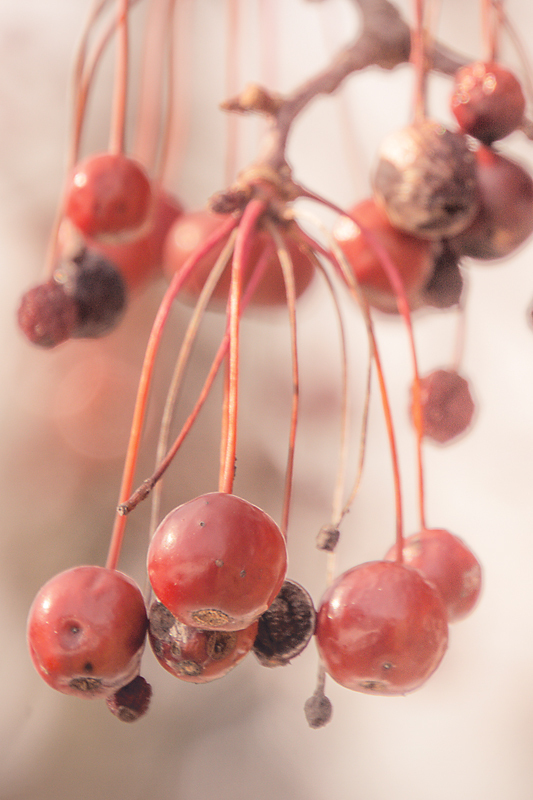 The only color I could find was some dried up berries still hanging from a tree across the street. I have seen some outstanding movies lately. I try to and see the nominated ones, so I can root for my best loved come OSCAR night. My daughter always has a gathering with Chinese food (?) from their favorite take-out. We each pitch in a couple of bucks and then pick our favs to win. So far I have seen "The Big Short" terrific movie but I have to admit all that financial jargon was a little confusing. "Room" you must see this to witness brilliant acting and the eyelashes of the young boy who spends the first 5 years of his life in the "room". And finally "Spotlight" another terrific movie about a group of investigative reporters that uncovered the allegations of abuse in the Catholic Church and it's cover-up in Boston. All three of these movies are brilliant. Now onto "Brooklyn", "Carol" and "The Danish Girl". Hesitant about seeing "Revenant" because of the gruesome scenes, but I have a feeling Leo is gonna win the Big O this year for his performance. I looked up the definition of revenant and the dictionary defines it as "a person who returns" or "as a person who returns as a spirit after death" for your inquiring minds. OK confession time. It has been years and I do mean years since I read "To Kill a Mockingbird" but I certainly remember the gist of the story. Our bookclub choose "Go Set a Watchman" also by the famous Harper Lee who wrote TKAM. I was reluctant to read it, but having memory issues over the original TKAM and knowing Watchman was supposedly her first draft but her editor convinced her to change the whole time-line with Scout being a child instead of a 20 something young woman, I began to read. And I must admit that if I hadn't heard all the brew-ha-ha over this new release I would have thought it was the perfect follow-up to TKAM. And yes, I liked it. It was a short book compared to today's new releases (less than 300 pages) and I read it in 2 days time. Then I read "The Edge of Lost", don't bother. I kept waiting for it to get better but it didn't. Now I am reading Karen Slaughter's "Pretty Girls" a psychological thriller about a family torn apart by tragic occurrences. Supposed to be disturbing, I like disturbing every now and again. I read the first few chapters last night and it roped me in immediately. I have rambled long enough. I hope the winter is kind to you, stay healthy, stay connected. I enjoyed your ramblings . . .
Often . . . it is all I have to offer . . . Happy you rambled movies and books too . . .
A blog update from you is welcome no matter how often you choose to post. 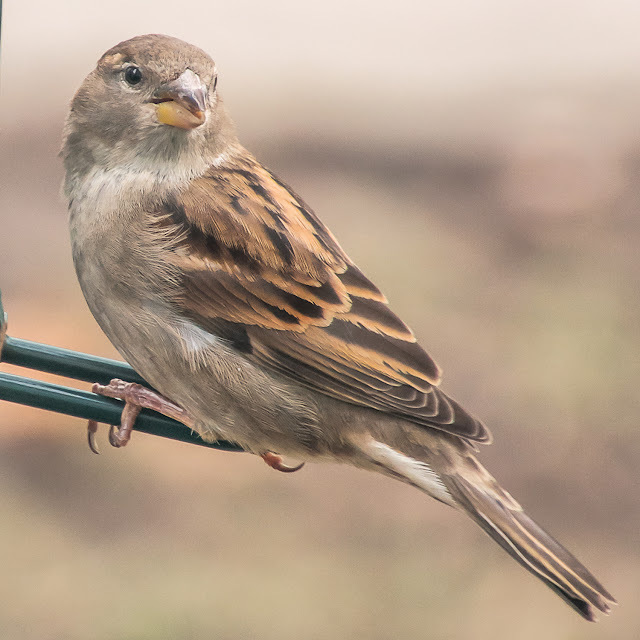 I love the bird photo even if it is brown. We keep getting snowstorms which is always good for a ski town. I only start complaining in May! I'm reading so many free or low-cost books lately, they seem to just blend into one another. I always enjoy finding both your thoughts and photos here. I saw Room and The Danish Girl - AMAZING. I so want to see Spotlight! So happy to read your 'ramblings'. Hope to see you here more frequently. I miss it when you disappear. Such fine details on the feathers of that little sparrow! I really liked hearing about the films and I had already jotted down a few of them to see. "Revenant" doesn't interest me for all the reasons mentioned. I don't enjoy violence in films, Oscar-worthy or not! I really like your header photos which bring in welcome colour in this long month of January! I have been losing followers lately too, and I do post mostly regularly, so I don't think that is a reflection of your not posting often. Something weird going on there! We read TKAM a few years ago for book club, I hadn't read it since high school. Loved it! We also watched the movie after I read the book. This summer there was a play at Hope College's Summer Theatre of TKAM. Loved that too. I have not read the newest book, but probably will at some point in time. Glad to hear you liked it. Thank you for this info...it makes sense now. Glad to hear you are alive and well, Deanna! I can related to your comment about the bird and life. J and I seem to keep busy, but I'm getting a little stale on the chore routine. I keep telling myself that my cattle need me, we will hopefully sell some steers soon and calving season will be here in a few short weeks. Yikes, I'm NOT ready for that! Books: TKAMB is one of my favorites. I've yet to read Watchman. I finished a Crime Thriller last week, "The Prettiest One" by James Hankins. It was intense and came from a viewpoint I had never read before. "The Guestbook" (First book in the Madrona Island Series) is a much by Andrea Hurst lighter read. Good to see your post today. - I always wonder when you don't post if everything is okay. - Sometimes I think we all think life is (boring and brown) especially during dreary winter days. Here it's more "grey" then brown with all the cloudy, rainy days we've had. But I'm thankful we haven't had a ton of snow either. Reading is always a good thing to do in the winter months. I just started a light-hearted romance novel. I'm not to into "deep" stuff as it tends to depress me. Anyway hope you have a great weekend. Brown and boring? It's funny, but when I opened this post, the first thing I thought was what a great photo that was of a very ordinary little bird, capturing lovely detail that we tend not to notice just because they are so common. Brown can be beautiful! And things are only boring (in my opinion) if you're not paying attention. I enjoyed your ramblinga...and especially the book recommendations. Well, I'm not going anywhere!!! Go Set a Watchman is on my list of books to read...kinda at the bottom..but none the less...on my list. Hmmmm...after reading the other comments...it finally dawned on me why my readership went down. I'll have to read up that. Hang in there Deanna!! !